In the beginning of the year, I used to create goals with my students and called it “Hopes and Dreams” based on the Responsive Classroom program. Then, back in 2013, Harry Banks (@kinderbanks) introduced the book, The Dot by Peter Reynolds to me. Immediately after talking about this book with Tabitha (@tabletj), told us about International Dot Day. Since then, instead of asking the students, “What are your hopes and dreams in X grade?” I’ve changed the question to “How will you make your mark in X grade? 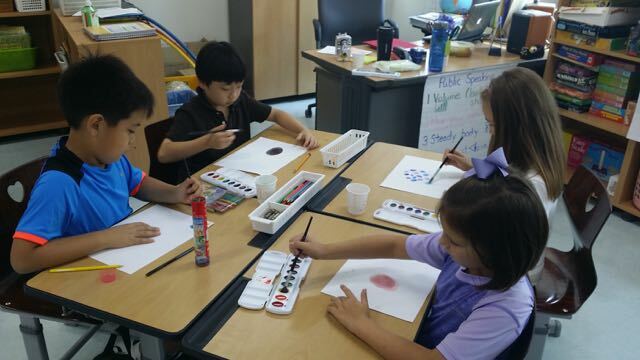 (the phrase that is used for International Dot Day)” After discussing what that means (how the students will be remembered), the students write about how they will make their mark, paint a dot, and record themselves reading how they will be making their mark. The dots, writing and video have now replaced my photo copied clouds where the students wrote their goals for the year. I also shared this video with Harry’s Class so that we were able to share Dot Day videos.